At the opening of the Abstraction x 5 exhibition, which includes abstractions by Graeme Hastwell, Beverley Southcott, Stuart Murdoch, Adam Dutkiewicz and myself, we launched the Abstract Photography book. 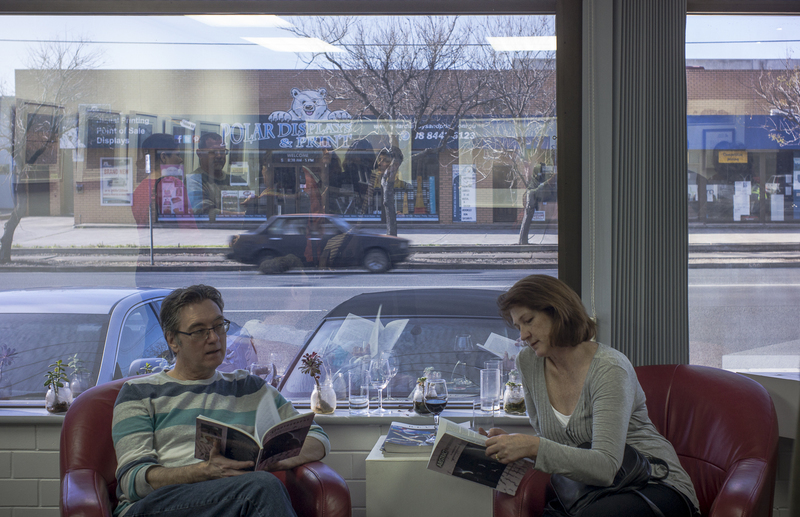 The exhibition and launch was yesterday at the Light Gallery in Adelaide to a full house. The book was written by Dutkiewicz and myself, and it recovers the lost modernist abstractions made in the 1960s by Adelaide photographers, has a couple of essays by Adam and myself and a number of abstract photographic images by Adam and myself. The full title of the book is Abstract Photography: Re-Evaluating Visual Poetics in Australian Modernism and Contemporary Practice, and it was published by Moon Arrow Press. It was the lo-fi version--the artist proof of concept--- was launched. The general reaction was that the history, text and contemporary images in the book hung together well to form a cohesive whole. We'd got there. The poster/flyer was designed by Eric Algra, one of three photographers involved in the project. He is the project member who has the most extensive photographic archives for the Mallee. 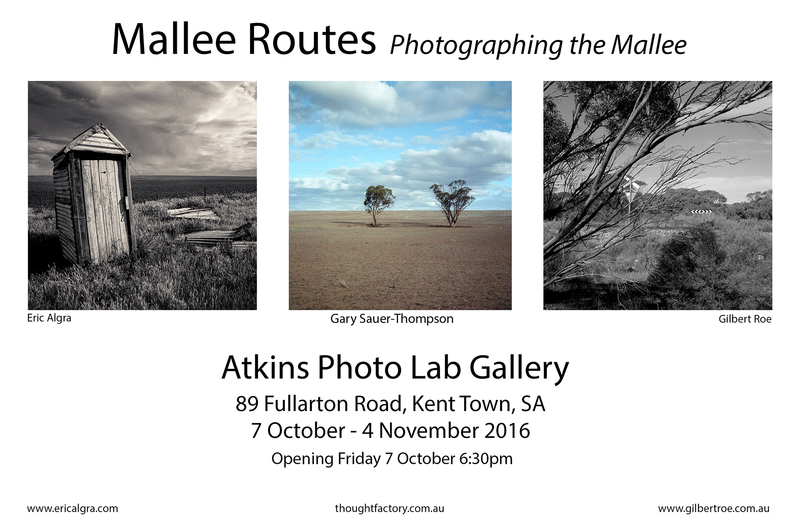 The Mallee Routes project has its own website---though this is still in a rudimentary state---with a blog containing a few posts. This means that the project now has a public profile. The overarching statement of the project can be seen here. 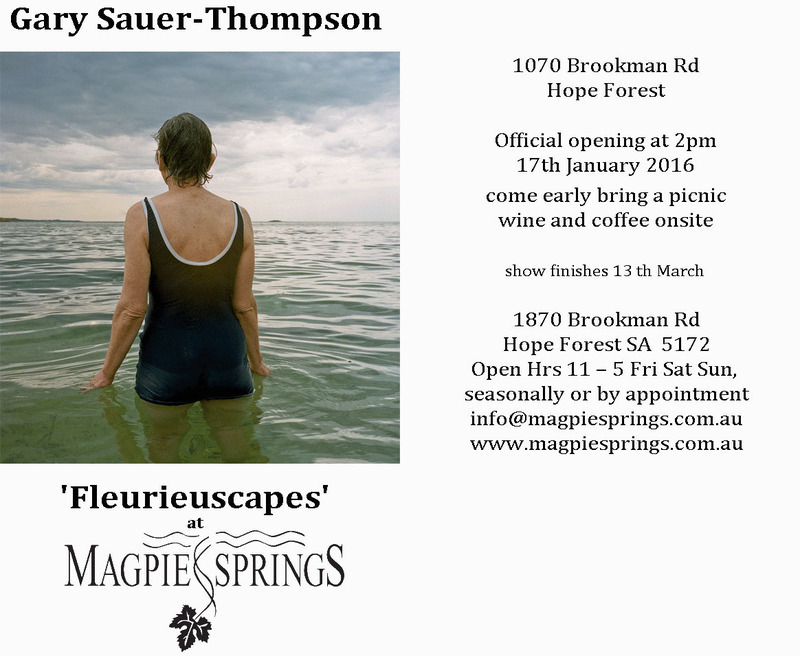 The Fleurieuscapes exhibition at Magpie Springs in South Australia's Fleurieu Peninsula has been hung, and everything is ready for the 2pm opening on Sunday afternoon, the 17th of January. The theme is people, space and place and this is the first part of the project. Rage second part is more historical in orientation and the palette is darker. The exhibition has been expanded from the Red Room, the main gallery room, to two rooms; and it now consists of 22 images instead of the initial 16. The images were made with medium and large format cameras, and there is a mixture of colour images and black and white ones, with the colours one predominant. My forthcoming exhibition at Magpie Springs in January 2016. It is the first step in the Fleurieuscape project and is a sampler, as there are many more images in the project. Some of the images in the exhibition can be seen on my website. The project is premised on photographs having an almost innate seriality: their sense is more easily accessed in the company of others; not just other photographs in a show, but also by other photographs by the same photographer. In our contemporary digital world, with its networked technologies, seriality is reworked as re-blog with the image being re-configured and modified as they proliferate across the web. 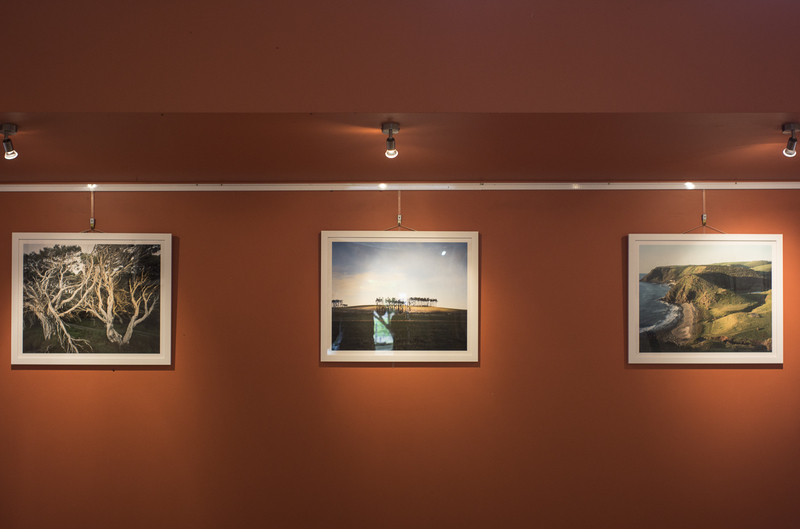 The Fleurieuscapes exhibition starts to explore the regional land/urbanscape of the Fleurieu Peninsula in the contemporary world of a borderless global capitalism, with its society of the spectacle. The regional is where we live amidst the commodity structure of a capitalism that transforms things into ghostlike appearances of themselves. The project is a representation of the sensuous particulars of the Fleurieu Peninsula as a place to be in, rather than as a tourist destination or a wilderness. It is a landscape that has been largely shaped by human beings who cleared the land for sheep and dairy farming. The aboriginal presence prior to the white settlement has been more or less obliterated. Their presence is marked by absence and memory.